It adopts LED the principle of biological color light therapy, through the latest concept of photodynamic therapy and skin to gently massage skin metabolism, promotes skin to absorb products faster, makes the skin bright luster. 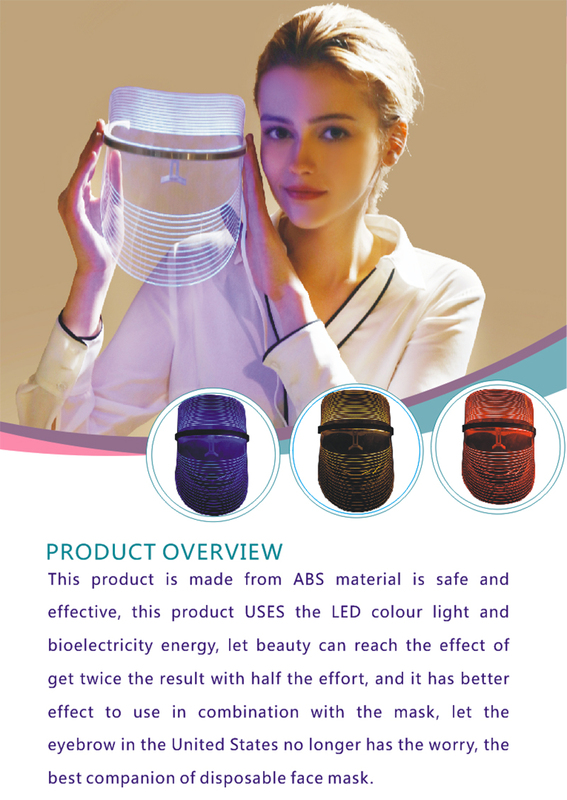 Spectrum hairdressing apparatus has two color light red, blue, the wavelength of 630 nm to 680 nm LEM red light, with high purity, the characteristics of strong light, the energy density uniform, played a significant effect in skin care and health care, is called the biological activity of light. The activity of the red can make cells, promote cells metabolism, make the skin collagen and fibrous tissue, to fill the skin collagen loss by the gap, accelerate the blood circulation, increase skin elasticity, improve skin yellow, dark wait for a symptom, so as to achieve the effect of anti-aging, anti-oxidation, repair skin, better than the traditional skin care effect. 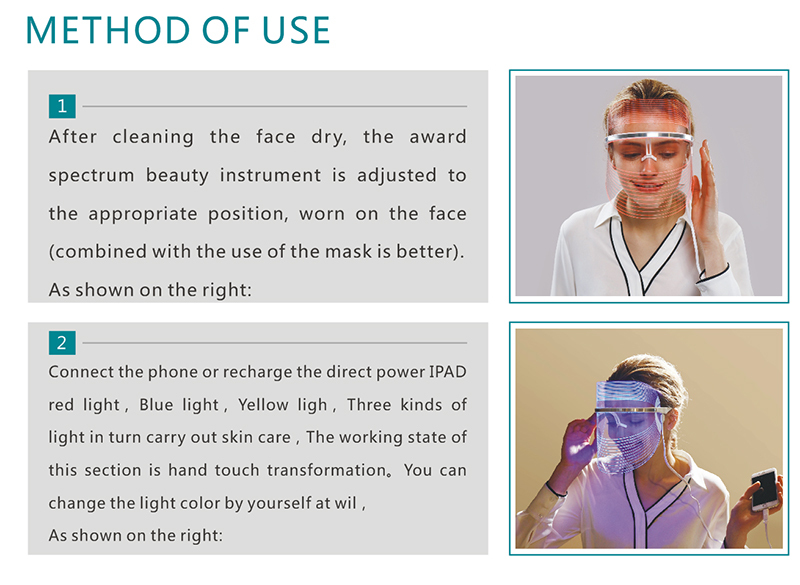 Using blue light with a wavelength of 420nm~460nm, it can effectively tighten skin to restore fiber elasticity, and it has a good effect on the sensitive skin. Yellow light with a wavelength of 420nm~460nm.Deep beauty for the skin.Cell regeneration and collagen secretion. Combine facial mask, essence can achieve beauty effect better. I've used this mask only twice (the red light) My skin is very sensitive and I suffer for redness, so I was a little suspicious, how my skin reacts. But I noticed that my skin likes it! I'll definately continue using this mask. The adapter was also a nice surprice, because the British sockets are different as Finnish. I am so amazed by the effects. Every night, right before I go to bed. I put on moisture lotion and use the yellow light for 20 minutes. Next morning, my skin looks shiny and healthy. I love it. The only downside is the mask is a little too big for my face. I have to use my hand to support it otherwise it will fall from my face. But overall, it’s a good machine for doing facials. 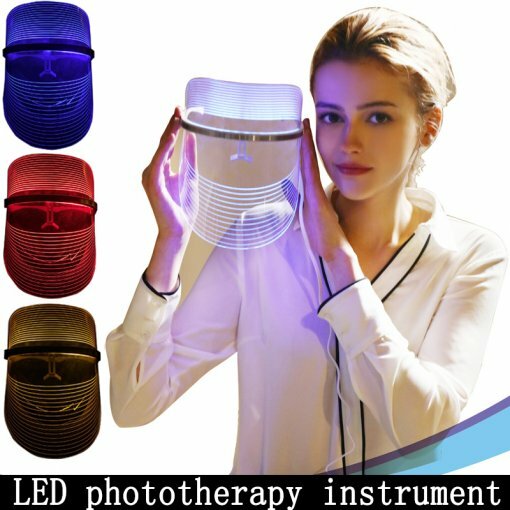 I am really amazed by this led mask for repairing and maintaining my skin through its LED lights. You can actually see the effects. I used it for weeks and found my face brighter and tighter when I looked in the mirror. Whenever I used the led mask after squeeze my black head, I woke up the next day to find that the scar had almost healed, and less red. I've been using this led mask every night for a few weeks. I hope it makes me younger. Only one thing that is when I wear the mask, it pressures my eyes, then becomes so uncomfortable that I have to lie down. Hold the mark in one of my hands. Because I am super addicted to phone such that I have to put on the eye mask and then put on the LED mask. Above all, I am very satisfied with this! I always choose the auto mode, let your skin get comprehensive maintenance, both environmental protection and practical, also save money. i tried the whole month. It’s wokring a little bit. But not that amazing. I will keep trying another month to see if it’s good or not. It's heavy on the face so you need to be lying down. There should be clearer guidelines given on eye protection. Haven’t seen any results as only been using a week, mask is very heavy and can feel slightly uncomfortable on the eyes. 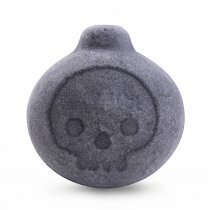 Great product love using this mask. For those who need some light therapy to treat light acne, but don’t want to commit the resources necessary for the high-intensity treatments available at a dermatologist, this could be the perfect product. It seems like the light therapy mask does have some positive effects. But as mentioned by several othe reviewers, Neutrogena is a bit too wasteful and (possibly) greedy with what they expect people to pay. The activator only lasts for 30 uses before it, with its plastic covering, electronic circuitry, and AA battteries, are supposed to be all discarded! So that you can buy a NEW ACTUATOR! At least they let you reuse the mask? A tad on the environmentally wasteful side, and just slightly ridiculous on the taking-your-money side. my son has been using this for almost a month and the dermatologist couldn't believe the difference!